That the trend is your friend, is probably the single most used line in the trading community. Of course, one may identify trends that last for extended periods of time in higher timeframes, such as daily or weekly charts. This is however rarely the case in intraday trading. Typically there are temporary imbalances that lead to a sudden increase or decrease in price. For a brief moment the market will know where it is heading. But then the sudden move stops and the market returns back to a bipolar mode. The new price levels are now being tested until there’s a new sudden move with a breakout from the trading range. The main idea of the Auction Bars is to identify these sudden shifts in value and to show reversal and breakout bars. Accordingly, the indicator identifies possible reversals patterns, i.e. 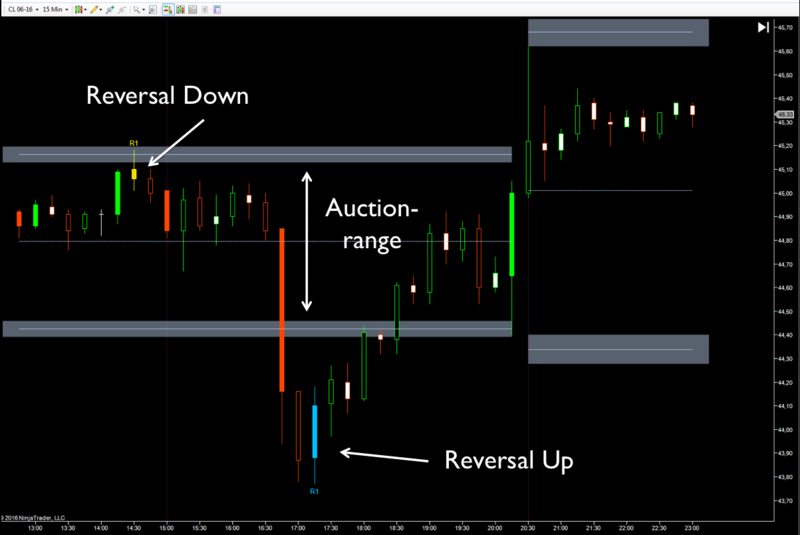 reversal or spike bar candidates, and what we call Auction Bars that break a current trading range. For reversal and spike bar, they only get labeled as such once confirmed. The default confirmation requires a price one tick above the high of a key reversal or spike bar up candidate. Opposite, it requires a trade which is priced at least one tick below the low of a key reversal or spike bar for a down candidate. For Auction Bars, the concept is derived from thrust bars. However, the close of a bullish Auction Bar is compared to the high of the current auction range instead of the high of the prior bar. A bearish Auction Bar will compare to the low of the current auction range, not the low of the prior bar. In order to improve the expectancy for trade entries based on key reversal and spike bars, the Auction Bars indicator comes with certain filters. For example a key reversal or spike must also be a preliminary swing high or low. Also, the reversal bar must have a significant range or volume (narrow range and low volume key reversal and spike bars are eliminated). Furthermore, one may also specify that key reversal or spike bars should only appear outside the auction range, or touch the congestion zone. It is recommended to apply additional price benchmarks as as filters for the Auction Bars. Tests have shown that support and resistance indicators, such as VWAPs, SessionPivots or Supply Demand Zones can be easily combined with reversal bars to improve results. The indicator comes with a detailed user manual. Session pivots are a well known trading technique used by market makers and were frequently used by local pit traders to calculate intraday support and resistance points. The technique has been around for decades, and because of its simplicity and efficiency it is still in use today. Pivots are calculated from the high, low and close of the previous day’s session. This information is available prior to the start of the current day’s session and does not change throughout the day. 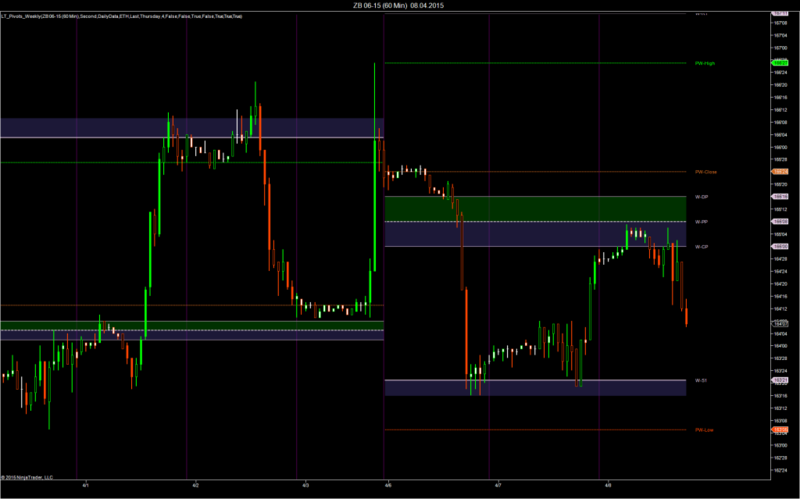 The Session Pivots Indicator package is available for NinjaTrader 7. All indicators are leading indicators and can be used to display Floor Pivots, GLOBEX Pivots or JacksonZones. Floor Pivots are calculated from high, low and close of the regular trading hours. GLOBEX Pivots are based on full session data. Jackson Zones are a symmetrical variation of pivots with the zones based on Fibonacci numbers. JacksonZones can be calculated from both regular and full session data. 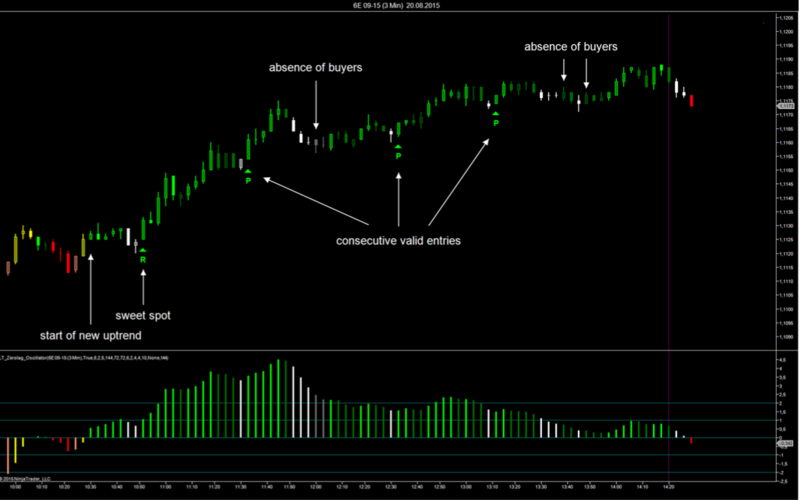 The indicators should only be used with session templates that reflect the contractual trading times of the instruments. In the event that your data provider supplies the settlement price for futures, the indicators have an option to use the settlement price instead of the regular close. The Session Pivots indicator package comes with 6 different indicators: The daily, weekly and monthly pivots can be used to display main pivot, central pivot, directional pivot and 3 major support and resistance levels, all based on the selected period. The JacksonZones will show the main pivot and two major support and resistance levels with the adjacent Fibonacci zones. All indicators have an option to add rolling pivots or zones, which are calculated from high, low and close of the prior n days, weeks or months. When the rolling period of the daily pivot indicator is set to 3, the 3-day central pivot or balance point can be displayed. Furthermore, all indicators allow you to plot pivot projections for the next day, week or month prior to the completion of the current period. The projections are based on the current period high, low and the last traded price. For futures contracts that are traded on CME or NYMEX, the indicators allow to calculate correct pivots for extended trading days and take into account current holiday schedules. Many institutional traders have their trade execution measured by volume weighted average price (VWAP). The VWAP is a benchmark that tells us the average price for all transaction executed during a day. Because institutional investors have their execution measured as good or bad by how far away they were from the average price, they will try to buy as close as possible to the VWAP. Accordingly, there are two ways of using the VWAP; trend filter and support and resistance level. 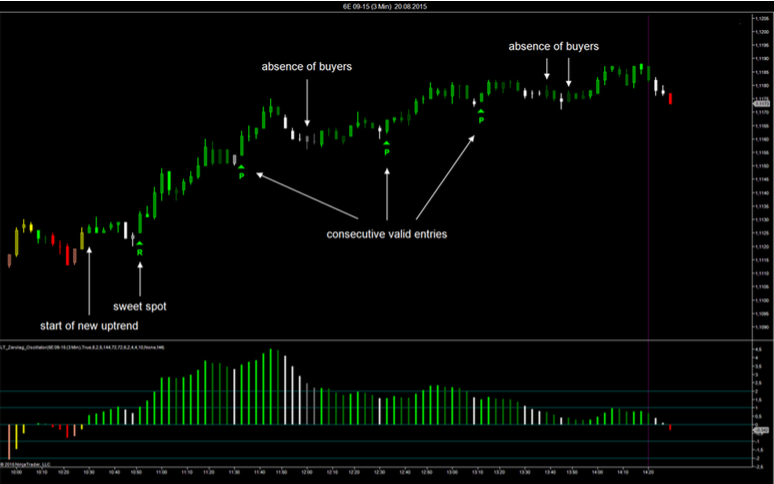 The Session VWAP indicator package is available for NinjaTrader 7. The indicator package contains a total of 15 different indicators including 5 VWAPs, 5 RWAPs and 5 TWAPs. 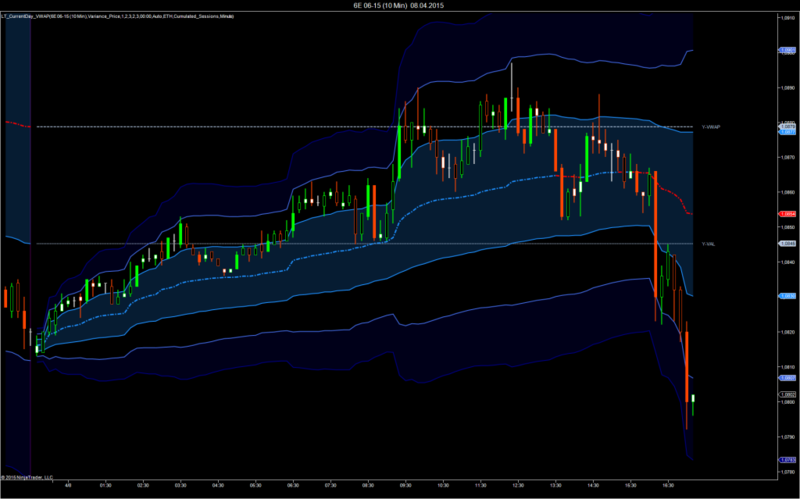 The VWAP indicators display the volume-weighted average price for a selected period. The daily, weekly, monthly and quarterly VWAPs are moving averages, anchored at the beginning of the period. The rolling VWAP calculates a volume-weighted average price of all trades in a moving time-window, and is not anchored at a specific starting point. All VWAPs are displayed with standard deviation bands calculated as a volume-weighted standard deviation from all trade data. The standard deviation bands may also be replaced by quartered range bands. If volume data is unavailable (or unreliable), you may choose the range-weighted average price (RWAP) as a substitute for the VWAP. The RWAP indicators have exactly the same properties as the VWAP indicator, however, the weighting is not based on volume data but the squared ranges of the price bars. RWAPs work particularly well for FOREX instruments. The package contains a daily, weekly, monthly, quarterly and a rolling RWAP. The remaining 5 indicators calculate the time-weighted average price (TWAP). The TWAP is known as a simple order execution algorithm. The price calculation is not based on volume data, but on time lapsed. Our preference for discretionary or automated trading is however the VWAP and RWAP packages. Aside from the current selected period, all indicators allow for display the average price and the value area for the prior day, week or month. The value area is typically tested during the current period, unless there is a runaway trend. Furthermore all indicators allow for displaying several average price levels from prior periods. For example, you may display VWAP or RWAP for the prior 3 weeks, then compare them to the VWAP/RWAP of the current week and thereby define the trend. The indicators come with a detailed user manual. When the histogram is above the zeroline, the histogram bars are plotted in lime or green color. These colors represent an uptrend. An uptrend favors long setups. When the histogram is below the zeroline, the histogram bars are plotted in red or salmon color. These colors represent a downtrend. A downtrend favors short setups. The oscillator uses a particularly long lookback period (default setting 144 bars) to display the current trend. This makes it easier to find valid trade setups. Counter traders enter new trends early. Those trades are typically high reward & high risk trades. The win rate of counter trades is low, as the old trend may resume and take out the stop. Also, the stop should be set wide, as volatility often peaks during trend reversals. However, the reward can be large, when the counter trend trade is successful. Although the Zerolag Oscillator can be used to identify counter trend trades by drawing divergences, this is not what it is designed for. The indicator is primarily designed for finding retracement entries. The idea is to find the middle chunk of a larger trend. This is also referred to as a wave 3 when using the terminology of Elliot wave patterns. Therefore the task is to find the sweet spot, where a new position can be built and held during the major part of the trend. This is what can be considered a sweet spot. A young trend has just imposed itself. New traders will jump on the band wagon while traders from the other side will close out their positions.